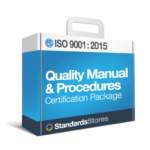 Building your QMS is a cornerstone of any successful ISO 9001 Registration. But why take the risk of starting from scratch? With our fully customizable Quality Manual and Procedures Package you will have all the processes and documents you need. The QMS Upgrade Instructions will save you much time when transitioning your QMS from ISO 9001:2008 to ISO 9001:2015.